Healthy teeth and bonesContains calcium and vitamin D3 to help maintain healthy teeth and bones. Contains antioxidant vitamin C to help support healthy gums and essential minerals to maintain strong teeth. Contains probiotic MOS to support the population of healthy bacteria within the gut. Contains an extract from the yucca plant thought to help reduce flatulent odours. We do not add any artificial colours, flavours or sugars to our foods. 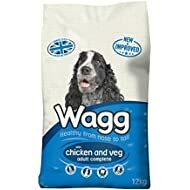 Wagg Complete Dog Food with Chicken and Veg is an ideal dog food for working dogs who prefer a poultry based diet. 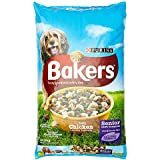 Packed full of protein and carbohydrates to provide bags of energy for active dogs. 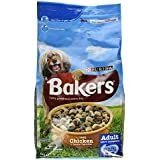 Added B vitamins assist the extra available energy to be fully utilised by your dog. Contains Balanced Nutrition in every mouthful. A quality complete dry working dog food in the Wagg range available at outstanding value for money. 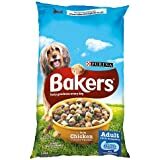 Approximate Dimensions (Product): 42 x 31 x 15cmComposition and Nutrition: Ingredient(s): Wheat, Meat Meal, Wheatfeed, Maize, Poultry Fat, Digest, Rice, Beet Pulp, Chicken Meat Meal (min 4% in brown chunk), Linseed, Peas (min 4% in pea kibble), Carrot (min 4% in carrot kibble), Lucerne, Minerals, Yeast (0.08%), Citrus Extract (0.04%), Yucca Extract (0.01%). Additives (per kg): Vitamin A (E672) 10,000 iu, Vitamin D3 (E671) 1,000 iu, Vitamin E (alpha tocopherol acetate) 90 iu, Vitamin C (ascorbyl monophosphate) 50 mg, E1 Iron (iron III ferric oxide) 1000 mg, E2 Iodine (calcium iodate) 2 mg, E4 Copper (cupric sulphate pentahydrate) 10 mg, E5 Manganese (manganous oxide) 50 mg, E6 Zinc (zinc oxide) 40 mg, E6 Zinc (zinc chelate) 60 mg, E8 Selenium (sodium selenite) 0.1 mg, Antioxidant, Preservative. 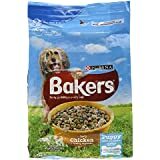 Additives: Protein - 21%, Fat Content - 8%, Crude Fibre - 3%, Crude Ash - 8.5%, Omega 6 - 1.4%, Omega 3 - 0.3% Feeding Guide (approx/day): Over a 5 to 7 day period, slowly decrease your dogs current food while adding increasing amounts of Wagg, until only Wagg is being fed. This information is provided as a guide only. Please refer to the product packaging for full details. Always provide a supply of fresh clean water.